Welcome to Sue Courtney's web log (blog) of vinous ramblings. One day I'll update it to proper blogger software but right now I haven't the time to research which blogging software is best, nor do I have the time to teach myself how to use it. I'll stick to archaic html to record my daily events. It's my on line journal and an adjunct to my website www.wineoftheweek.com which is for more formal tasting notes and articles. You'll find links to other wine blogs on my Vinous Links page. If you want to make a comment, drop an email to winetaster@clear.net.nz and, if appropriate, I'll post it in the appropriate place. Click here for this site's RSS feed. Oct 10th: A trade tasting with a difference. Oct 7th: At least we won something! Oct 6th: Just how long does a previously opened bottle of Barossa Shiraz last? Popped out to Coopers Creek Vineyard in Huapai the other day. The entrance to the tasting room looked gorgeous with the purple wisteria in full flower overhanging the trellising above the little brick courtyard and the kowhai, just a couple of trees along from the entrance, brilliantly yellow. This is the memory that sticks most in my mind, yet when I took photos, the camera only pointed at the grapevines beside the entrance driveway. Coopers Creek have just released the 'Select Vineyards' series for this year. I was invited to the launch of the Series in 2006 but I said I'd rather drive out to the vineyard than go into the city to be stuck in traffic and have parking hassles. By the time I actually made it to the vineyard, several months later, the wine I most wanted to taste, the tiny production Arneis, had long gone. No such problems this time - the grower in Gisborne had twice the number of vines for Coopers Creek to harvest from, and it was a 'dream' vintage to boot. Having now tasted all the latest releases from Coopers Creek, the quality of the 2007 vintage does shine, right across the board. And the other wines aren't bad either. The Coopers Creek Pinot Gris 2007, a blend of Huapai and Gisborne fruit took out the Trophy for Pinot Gris at the Liquorland Top 100. Simon said he thought the silver medal winning Coopers Creek SV 'The Pointer' Pinot Gris 2007 from Marlborough was better but after tasting both wines with a selection of food, it was the less powerful Trophy winning wine that worked best. It even matched to ostrich. But it was the Coopers Creek SV 'The Little Rascal' Gisborne Arneis 2007 that stole my heart. It's this week's "Wine of the Week". Click here to read it. A New Zealand wine picked up two gongs at the 2007 Japan Wine Challenge. It was judged in July with 108 gold medals awarded from the entry of around 1,700 wines from 20 different countries. Like many other international competitions, wines are judged against wines from their respective countries at first. Then the top wines go on to compete for the trophies. Results were announced earlier this week. Sileni Estate Selection The Lodge Chardonnay 2006 Bay won the Trophy for the Best New World White Wine and the Air New Zealand Trophy for the Best New Zealand Wine. They don't have Trophies for 'Best Chardonnay, 'Best Sauvignon Blanc', etc. Did you know that one of the world's most popular wine websites is based in New Zealand? No, it's not www.wineoftheweek.com (although it would be nice if it was), nor is it any of the locally based 'wine portals' that claim they are this country's biggest and most popular. It's a site called www.wine-searcher.com, and it's loved by wine buyers throughout the world but particularly by collectors in the USA and the UK. But it may surprise many people that it is a New Zealand operation. It's the brainchild of New Zealander, Martin Brown, who launched the website to the New Zealand trade and media on Wednesday. Martin, a clinical psychology major, had realised that a career in that field was not for him, so he retrained as a computer programmer then left New Zealand for London, where he scored a job with wine merchants, Berry Brothers and Rudd. To keep the wine company at the fore, the marketing department evaluated the wine lists of competing stores so Martin, now IT Manager, developed a computer system that would make it quicker and easier. 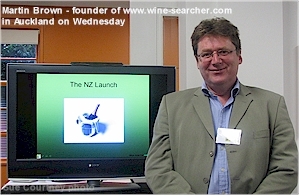 He enhanced the idea in his spare time and in 1999 www.wine-searcher.com was born. He thought his system would be widely used by the trade but his initial vision of who would use the service turned out to be wrong as consumers discovered it and drove the business forward. It started as a manual operation but Martin soon realised he needed support. He had help in London but his sister in Wellington looked after administration and a small team of four programmers was set up in Auckland. They developed a complex spider software program to retrieve wine lists from the World Wide Web and manipulate the data into a consistent form, tidying up wine descriptions (Grange Hermitage becomes Penfolds Grange), vintages and wine regions, fixing misspellings along the way (eg. Brodeaux becomes Bordeaux). 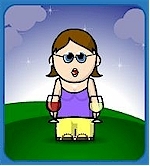 The data is transferred to the database that drives the wine-searcher.com website. Now Martin has returned home and the operation has been fully consolidated in Auckland. The web servers are still based overseas but the staff of 10 includes 7 computer programmers and two wine experts. The system includes lists from over 8,600 stores in over 50 countries. It is free for a store to list on the website and users can dial up www.winesearcher.com and look up for free where they can buy a certain wine. So how does www.wine-searcher.com make money? They make their money from users who buy the 'Pro Version', at US$29.95. This version provides much more information and more 'hits' and pricing information for a searched wine. There are many other 'Pro Version' features including 'alerts' if a sought after wine suddenly becomes available. Retailers can also advertise. It's obviously working because www.wine-searcher.com has over 10,000 subscribers. The site attracts over half a million visitors each month with over 55 million page views each year. Revenue for 2007 is expected to exceed $2million. "We are a profitable, debt fee company with positive cash flow from our operations," says Martin. Independent statistics show that www.wine-searcher.com is well ahead of competing sites, www.winezap.com and www.cellartracker.com. Sixty percent of the users are from the USA. The UK, with almost 14% of users, is in second place. New Zealand users don't even figure in the Top Ten user countries. "We'd like to increase our New Zealand usage considerably," says Martin. "The world knows about us but many kiwis don't". Dial up www.wine-searcher.com, type in your favourite wine into 'Wine Name', add a vintage if you wish, and see what results you get. Example panel displayed below. Incidentally, the most searched for wine is Chateau Margaux. The Kowhai Festival is being held in Warkworth this Saturday (13th October) with some of the Matakana winemakers taking part. Participants include Ascension, Coxhead Creek, Hyperion, Hawk's Nest, Heron's Flight, Hinchco, Takatu, Ti Point and Ransom Wines. It's being held from 10am to 4pm, in the wharfside area beside the river. Warkworth is just 45 minutes north of Auckland City on a good traffic day. Meanwhile tickets to 'Toast Martinborough' on November 18th, sold out in just 19 minutes when they went on sale yesterday, beating the previous record set of 50 minutes in 2001. If you want to go to Toast Martinborough and you don't have tickets, then it seems it is best to join 'Friends of Martinborough' where tickets privileges start two weeks earlier. It costs $100 a year subscription fee and members can buy up to six tickets. Just ten wineries are participating in the 2007 'Toast Martinborough', which is as much a musical extravaganza as well as a wine and food event. The 13th annual Harvest Hawkes Bay Festival has just been announced. It's being held on February 2nd and 3rd 2008 at various winery venues with 26 wineries taking part. Buses will travel around the venues on the Saturday only but specialist wine workshops, tastings, concerts and entertainment take place throughout the weekend. A bus pass costs $40 and a festival glass costs $15 (plus booking fee for advance tickets, which is advisable as the bus passes sold out quickly last year). Wine tastings cost extra at each venue. The full programme comes out on October 20th, which will come in very useful to plan your itinerary in advance. All aboard the Island Escape with Captain Clive for a wine tasting with a difference. Negociants New Zealand with Clive Weston and his crew really excelled yesterday when they took their road show to sea. The luxury cruise boat, Island Escape, was a magnificent venue for the distributor's tasting and although the sky was a little overcast, the water in Auckland's Hauraki Gulf certainly came to the party by producing glassy, flat conditions that hardly rocked the boat at all. While anchored in the lea of Motuihe Island, a decadent buffet lunch served on the poop deck started with seafood (crayfish, scallops, prawns, mussels, oysters, salmon and snapper) followed by a succulent pig that had been roasting on the spit since 8am in the morning. A blend of about 70% Pinot Noir and 30% Chardonnay and primarily 2004 fruit. Delicately smoky and savoury on the nose and bright and bubbly in the palate with a creamy mousse adding to the mouthfeel with toasty lemon bread flavours and a crisp, dry, freshness to the finish. Delicate hints of pinot noir's herbal savouriness underlie the wine. It's very, very good. $38. Made from 100% Pinot Noir, there's a richness to the bright ruby hue. Tantalising aromas of strawberry, raspberry and cherry and crisp, fresh flavours of cherry and spice with just a touch of savouriness make this dry and textural pink, very very appealing. I wasn't surprised when I heard that Mike Just had a lot to do with this wine. I really respect his winemaking. Luke Cowley (pictured) is taking on the major winemaking role from next year. 13.5% alc. $28. Quite pale in the glass, this rich, mouthfilling, fruity style has a lovely attack of flavour and flow. Hints of herbs and citrus zest on the nose and a delicately herbaceous citrussy undercurrent balance the juicy fruit. Long, rich and tasty with an earthy, stony depth, this bone dry wine had 3-4 months on its yeast lees. This label is owned by the Antinori family with Lodovico Antinori having input into the winemaking. I think this is the best under the label yet. 13% alc. $21. Screwcap. Predominantly Martinborough fruit with some from Gladstone and Marlborough too, this is fresh, crisp and juicy with a green fruit richness (green melon, perhaps), a tangelo brightness, a well proportioned herbaceousness and fruit sweetness on the long, bright, tasty, zesty finish. Tasty with plenty of user appeal. 13% alc. $20.50. This is the only wine from the Palliser range that I tasted, as I had tried them all on release. The exciting Pinot Gris that I raved about then was getting very good raps. Saint Clair excels with every single sauvignon blanc it produces - and they were all there for tasting. I had previously tasted through the range, but I found another star in their line up. Continuing the excellence that the vintage has shown so far, this is verging on an Alsace style with a lusciousness to the delicately oily and slightly nutty palate. It's fragrantly scented with pear and musk while the crunchy pip fruit is deliciously juicy. 13% alc. 24g/l rs. $25. A dry, crisp, almost steely Pinot Gris with an underlying lusciousness and classically varietal flavours of pears and apples that build to a long, creamy and lightly spicy finish. A delicious dry wine with even more spicy opulence on the lingering aftertaste. 13.5% alc. $27. Fragrantly scented and richly flavoured, this gorgeous wine is all about texture with a gently assertive attack of flavour and power. Full of tangelo and lime zest with orange water, honey, musky spices and ginger - it has it all. It's about 15 months since I last tasted this wine, and it's still evolving. Just hedonistic for GW fans. With just 10.5% alcohol, this is a bright, zesty wine with ginger spice and an abundance of juicy fruit with a tangy, citrussy brightness to the dancing finish. Served chilled, this medium sweet wine is just delicious. $21. "There's a 'reserve' coming out later in the year and it's even better," said winemaker Frank Manifold. Bright gold. Smoky French oak on the nose with just a touch of toastiness to the peachy fruit leads into a rich, powerful, toasty palate imbued with stonefruit and spicy mealy flavours. Creamy and long with a touch of acidity adding brightness and lift to the toasty finish, it's sophisticated, dry and simply seamless. $36. The Pinot Noirs really showed excellence right around the room but these three stood out. Lighter in colour than most Pinot Noirs in the room and a noticeably more cherry aroma - but a delicious savoury flavour with a light silky texture that belies the richness and depth of the wine. I call it 'pretty' and 'elegant' with cherry, sweet spices, hints of chocolate and an abundance of pinot noir charm. 13.5% alc. $36. A deep colour hints to the richness within the glass. It's quite closed on the nose at first but full of vibrancy in the ripe, creamy, spicy palate with savoury oak, red guava and black cherry fruit, silky tannins and power, richness and depth. Fantastic length that shows the long term potential of the wine. 13.5% alc. $40. Cork. Rich and dark in its Burgundy colour, it's so ripe, so clean, so integrated. It's savoury and chocolatey with a bright spiciness and underlying earthiness with a quite grippy tannin structure and anise and florals emerging on the lingering finish. A big style, but it will definitely age. I rate it 'excellent'. 12.8% alc. $54. Diam. Also lots of thumbs up from many people I spoke to for the Auntsfield Hawk Hill Pinot Noir 2006. Deep ruby, not quite opaque, with a peppery, spicy aroma and spicy, creamy blueberry and cherry flavours. A lighter style but a great little juicy quaffer with hints of chocolate and a long, fragrant aftertaste. 12.5% alc. $27. Savoury and smoky with a silky tannin structure, a 'sweet leather' undercurrent and hints of dried herbs while lifted acidity adds brightness. It has a Bordeaux character with currant-like fruit while smoky oak adds a lovely note to the finish which is long in its subtle attack. Later chocolate emerges on the nose and in the palate. Great value at $25. 13.5% alc. Diam closure. The last wine I tried, just as the boat was pulling into the dock, and a lasting memory it left in my mouth. Deep golden yellow in colour with gorgeous inviting and seductive aromas of apricot and botrytis. Simply nectar in the palate - nectar, honey and honeysuckle florals with zesty spices and even a tiny hint of VA, which is OK in this wine. Plus orange honey marmalade, candied fruit and hokey pokey. Just delicious. It has 12.5% alc and a whopping 220g/l residual sugar. $63 a half bottle. Prices quoted are probably the maximum retail. The rest of my notes will be added to my Wine Review pages, as soon as I get them typed up. I've just been invited to Marlborough Wine Weekend and I'm so excited because it sounds like one amazing weekend that's totally aimed at consumers rather than the 'wine trade'. It starts on Friday October 26th with a tour of the three valleys - Awatere Valley, the Southern Valleys and the Wairau Valley. That evening, 25 of the regions winemakers will be pouring their wines at the Old St Mary's Convent with local cuisine designed by Marlborough's celebrity chef, Chris Fortune. On Saturday morning, the Grand Tastings with local wines and International comparisons take place. Stephen Bennett MW leads the International Sauvignon Blanc celebration then Bob Campbell MW Chairs the Pinot Noir tasting. Lunch is at a local winery where a selection of Rieslings will be able to be tasted. Dinner is a bit more 'posh' with Martin Bosley from The Yacht Club in Wellington designing an exquisite 5-course menu to accompany Marlborough wine. During the Gourmet Dinner, someone is going to receive the inaugural Empson-Herd Lifetime Achievement Award in honour of the pair of men who are believed to be Marlborough's first winegrowers. Charles Empson who co-owned the property now known as Auntsfield, and David Herd who managed it, planted a small one-acre vineyard in Paynters Rd (in the Southern Valleys) back in 1873. The vines were Brown Muscat and trailed over loose wires, held aloft by manuka posts. Producing around 800 litres, the sweet red wine gained a number of accolades. The wine was also commended for its medicinal properties. Lastly, on the Sunday to recover, a gentle cruise through the Marlborough Sounds ends up at a mussel farm where freshly steamed mussels will accompany Marlborough bubbles. The weekend is limited to just 300 participants and tickets cost $635 for the Friday and Saturday events, and a further $75 for the cruise. All the details and a list of the 35 participating producers are available from http://www.wine-marlborough.co.nz. If this kind of leisurely glamour wine weekend is not your thing, check out details of the 25th Anniversary Marlborough Wine Festival 2008. It's being held on Saturday 9th February at Brancott Estate and entry tickets cost just $40. But there are heaps and heaps more people and you pay for your wine and food on top of the entry. At the Marlborough Wine Weekend, it's all inclusive. Quite honestly I'm over it. Glad I'm not one of the kiwis heading off on their trips of a lifetime, the trips they've planned over the last year or two - and now they're going, only the All Blacks won't be there. They'll be back here. So I'm glad I didn't win any of the competitions I entered to win a trip to the Rugby World Cup - although if I had it would have been an opportunity to make a detour to Alsace while countries other than New Zealand were playing for 1st, 2nd, 3rd and 4th places in Saint-Denis. 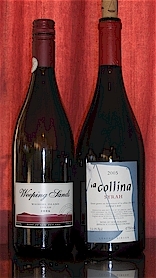 So I drowned my sorrows with ain interesting line-up of Kiwi Syrahs, including the aptly named Weeping Sands Waiheke Island Syrah 2006 and the Bilancia La Collina Hawkes Bay Syrah 2005 - my joint Wines of the Week. Check out the reviews at this link. At least we won something! New Zealand may have lost the rugby, but New Zealand wines are still going on about their winning ways with two kiwi wines taking honours on the world stage that is the 2007 International Wine and Spirit Competition, held in London. The Bouchard Finlayson Trophy for Pinot Noir goes to Villa Maria Cellar Selection Marlborough Pinot Noir 2005. It is the second year ina row that Villa Maria beat all comers to take out the top Pinot Noir trophy. Ata Rangi was the last NZ winery to have repeat wins, in 1995 & 1996. New Zealand has had a long tie with the Sauvignon Blanc trophy, winning it the last seven years in a row - and 15 of the last 18 years. Back at home the Liquorland Top 100 results have been announced and this time Australia has come out on top with Oakridge Yarra Valley Chardonnay 2006 taking the trophy for Champion Wine of the Show as well as the Chardonnay Trophy. Saint Clair is 'third time lucky', at last winning a Sauvignon Blanc Trophy in their third show of the season. It was the super reliable Saint Clair Marlborough Sauvignon Blanc 2007 that got the gong. Well done! 67 gold and 33 silver medal wines make up the 'Top 100'. Just how long does a previously opened bottle of Barossa Shiraz last? I had a bottle of Grant Burge Filsell 'Old Vine' Shiraz 2005 in a box of partially consumed wines, this bottle having been opened on Wednesday Sept 12th. It was a leftover from the judging at NZ International Wine Show and I had the wine at home to write the 'official' notes. There was about 200 ml out of the bottle, perhaps a little less, and the cork had been firmly replugged. Last Thursday (Oct 4th), Neil wanted something to accompany his dinner. Remembering how good the Filsell had been at the First Glass tasting of Trophy winning wines the night before, I said to Neil, "Why don't you try the Filsell that's in the box". It could have been oxidized. It could have been stuffed. But instead it was amazing. Still very spicy and fruity, the only thing that perhaps jumped out at me was that the American oak component was now much more overt. I only had a quick sip then but now it's Saturday morning as I taste this wine and write this note - 24 days after the wine was originally opened. I thought some hint of oxidation may now have started to creep in, but no, the wine hasn't deteriorated at all. This glorious wine is a revelation. No loss of its inky deep purple red colour, gloriously fragrant aromas of black cherry, creamy oak, berries and spice and delicious flavours of dark chocolatey oak, pepper and fruit cake spices, concentrated cherry and mulberry fruit with a powerful, full-bodied, thick texture and long, long varietal Barossa Shiraz finish. How's that for longevity in a previously opened bottle? Utterly amazing. Checking the notes on the Grant Burge website, I see the wine was matured in new and two year old American and some French oak hogsheads for 20 months before bottling. It also has 15% alcohol. Perhaps its the oak and the alcohol that's the preservative. However with wonderful balance of the components, it didn't seem overly 'gobby' or hot to me. I'll be looking forward to finishing the bottle with dinner tonight. Terry Copeland, Chief Judge of the Christchurch Casino's First Taste Sauvignon Blanc Awards for South Island wines, was on Breakfast television on Wednesday talking about judging sauvignon blanc. Click here to navigate to the TVNZ page and select the video from the menu (Jack Tame tastes Sauvignon Blanc). On the nose Terry is looking for lovely sauvignon blanc fruit and the secondary characteristics which he describes as having a 'herbal nature'. In the palate he's looking to reinforce what he found on the nose but he's also looking for intensity of flavour and typicity - does it really taste like a great sauvignon blanc or is it just another lovely wine. I judged Sauvignon Blanc at the New Zealand International Wine Show, where Terry also judged, and want to add to what Terry says. I think one of the most important things about judging sauvignon blanc is to give each wine the time it deserves - smell the wine, taste the wine, let the flavours expand and linger on the palate but especially give the wine time to let that all important sauvignon blanc aftertaste kick in. The aftertaste and length is as important to me as the aroma, the attack, the texture, the balance, the intensity and the flow. I taste the wine and write my notes and either that aftertaste comes or its doesn't. This method also gives time to appreciate the style that the wine is made in. This method ensures that some of the more austere styles are not overlooked. One of the key things with judging sauvignon blanc - and other varieties - is you have to be aware of all the styles that are produced in this country and overseas, because, in the NZIWS at least, wines from all the participating countries are judged together in the particular classes. You can't pigeon hole anything. You can't mark down a wine because it is an 'alternative' style. That said, it does have to taste like the variety is is meant to be, as Terry says, "it has to have typicity". At the NZIWS, the final score a wine receives is by consensus. Initially panels of three senior judges (and one or two associates) assess the wines. If there is a huge discrepancy in the scores of a particular wine by the three seniors, they say what they like / don't like about it, the wine is retasted and scores are adjusted or left as they are. From each 'flight', high scoring wines are 'recalled'. They are poured from a new bottle and rejudged with the three senior judges and the Chief Judge (Bob Campbell MW) and the Assistant Chief Judge joining in. At this stage you don't score as such, but just say 'gold' or 'silver' (or even bronze). This determines the final medal - so at this stage of the proceedings at least three of the five judges have to go gold, for the wine to get gold. However if a wine was judged gold by all the senior judges (a triple gold) in the preliminary round, and doesn't go gold on the recall round, a third bottle is opened for further assessment. People say that wine shows can be lotteries. The people who say this obviously have not been involved in wine shows. I think the system is very fair. The Champion Sauvignon Blanc at the New Zealand International Wine Show was the Blackenbrook Nelson Vineyard Sauvignon Blanc 2007. This is a truly remarkable savvy, picking up its second Trophy at NZIWS, a repeat of its performance at the Bragato Wine Awards held in August. I'm pleased to find from the list of wines that I judged, that I received today, that this little beauty was put through by our panel. A solid gold, gold, gold, gold, gold from the recall round, it was our panel's pick from that flight to go through to the Trophy round. In the Trophy round, the top wines are tasted, without discussion, by all the senior judges involved in the judging of the class (11 judges in all for sauvignon blanc). They write down the number of their favourite and second favourite on a slip of paper and hand it to the competition convenor, who collates the totals. "It wasn't even close," said Kingsley Wood on the Awards night, of the Blackenbrook win. I tasted this wine again at the Trophy Wines tasting held at First Glass Wines & Spirits on Wednesday night. The quality of the Blackenbrook Nelson Vineyard Sauvignon Blanc 2007 was hugely reinforced. It's light golden coloured with powerful aromas and flavours of citrus, apple and nectarine with underlying gooseberry and tropical fruit. It's juicy and flavoursome with an amazingly long finish where hints of tobacco, tomato stalk and capsicum emerge. A wine of richness and power with a wonderful texture, bright acidity and balance all the way through. And it's under $20 a bottle. All my notes from the Trophy tasting are now on my Wednesday wine reviews page. The Christchurch Casino's First Taste Sauvigon Blanc Awards are judged on November 1st. Cloudy Bay, New Zealand's most iconic label for sauvignon blanc has just been released. "There is hardly a wine buff anywhere in the world that hasn't heard of Cloudy Bay Sauvignon Blanc. It is undoubtedly New Zealand's most internationally acclaimed wine, and with good reason. Its pale straw colour belies the exotic, explosive aromas and zesty flavours that persist from the first sniff through to the last drop. The bouquet exudes marvellous herb, green pepper, anise and lemon aromas. The sumptuous mouthful of flavours is deliciously balanced by a refreshingly crisp and inspired citrus finish. Superb." At NZ $31.90 a bottle (!!!!! ), is this NZ's most expensive non-alternative sauvignon blanc? Been off-line for a few days, not a hangover from the recent NZIWS celebrations, but from the storm that hit on Monday afternoon, crippling my ADSL modem. All fixed now though. It comes as a surprise to hear that the Waiheke Festival of Wine, scheduled for February 2008, has been cancelled. In my mind, this was one of the best festivals on the festival circuit. "The cancellation of the 2008 event is partly due to the scale of the event which has grown to the point where it exceeds the resources of the Winegrowers Association," writes Chris Canning in the press release. Waiheke wine and music lovers do have a substitute for the cancelled wine festival, however. Australia's Litter River Band will play in the stunning new amphitheatre at Ridgeview Estate on Saturday 29th and Sunday 30th December 2007. Visit www.ridgeviewestate.co.nz for more information. Tickets cost $99 for general admission and $175 for reserved seating and go on sale on October 15th. Pernod Ricard has announced that, subject to New Zealand Overseas Investment Office approval, Pernod Ricards Framingham wine brand, winery and Marlborough vineyards will be sold to Sogrape, the family-owned international quality wine company based in Oporto in northern Portugal. Sogrape owns the famous Portuguese ros� wine brand Mateus and well known Porto brands Sandeman, Ferreira and Offley. The company also has significant wine interests in Spain with Sandeman Jerez and in Argentina with Finca Flichman. Pernod Ricard will retain the distribution rights for Framingham in Australia and New Zealand. The Tri Nations Wine Competition is a unique wine competition between the three rugby playing nations in the Tri Nations series. The wines that compete are selected by Bob Campbell MW from New Zealand, James Halliday from Australia and Michael Fridjhon from South Africa. They each select the wines from their respective countries to be judged in each of the 13 classes. You can see a list of invited wines from the link at www.trinationswine.com. For the first time, the awards evening for this unique wine competition between New Zealand, Australia and South Africa is being held in New Zealand. It's being held at the Royal New Zealand Yacht Squadron, 101 Curran Street, Westhaven, Auckland, on Monday 12th November. At 6.30pm, prior to the dinner, taste the winning wines from each class. At 7.30pm, the three-course dinner features the winning sparkling wine and winning red and white wine and Wine of the Show. Who will take the Tri Nations Wine Trophy this year? Come to the dinner and find out. Bob Campbell MW will present the awards. Tickets cost $85 per person. Email Judith Kennedy for a dinner booking form.